The KV-220 externally differed from ordinary KVs by the greater length of the hull, an increase of one support roller in the track, and a new turret with the 85 mm F-30 Main Gun. The weapon was specially designed for arming this tank in the design bureau of Plant No. 92, under the supervision of Grabin. It was tested successfully in the T-28 Medium Tank in the fall of 1940. Because of the steep growth in the weight of the tank, which now reached 62 tons, the V-5 engine with 700 h.p. was mounted. Testing of the KV-220 commenced on 30 January 1941 and was halted the very next day because of engine failure. In contrast to artillerymen, tankers were falling far behind in the development of a new heavy tank. Therefore they decided to employ the KV-220 to accelerate the work of testing the new assemblies and aggregates of the KV-3. 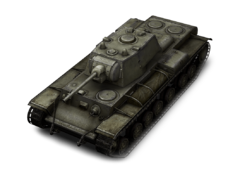 On 20 April 1941 a new engine was finally mounted in the KV-220 and the tank, loaded up to 70 tons, the loaded weight of a KV-3, was submitted for testing. By the end of May 1941 it had been driven 1330 kilometres. In the report of the plant test personnel it was noted that the tank had "a poor-shifting transmission, the support roller spindles and suspension arms had bent, the torsion bars had twisted, and the engine lacked sufficient power for a 70-ton tank." On 20 May the KV-220 was brought in for repair, in the course of which the vehicle received a V-2SN Diesel Engine with supercharger producing 850 h.p. The tank was subjected to testing again beginning on 30 May and by 22 June 1941 had traveled a total distance of 1,985 km. But because of problems that arose during the preparation of the forged turret, the work period was extended. In total, only one prototype was constructed in 1941. This page was last modified on 4 July 2017, at 10:05.